Bobby McFerrin: Gimme 5. CircleSongs. On the stage are 17 empty chairs and 17 microphones. The performers walk on. At the back, dressed in black, are 12 men and women, an a cappella choir organised by Pete Churchill (the musician who made the extraordinary Miles Ahead vocal project happen), which was packed with local heroes. 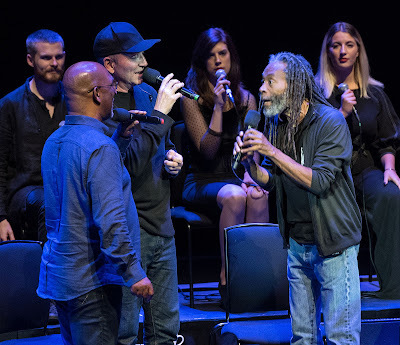 In front of them are the five members Voicestra, Joey Blake, beatboxer Dave Worm, Rhiannon, Judi Vinar and in the centre, Bobby McFerrin. Within a few minutes, the Barbican hall is full of sweet music, freshly minted out of thin air and the imaginations of the musicians. 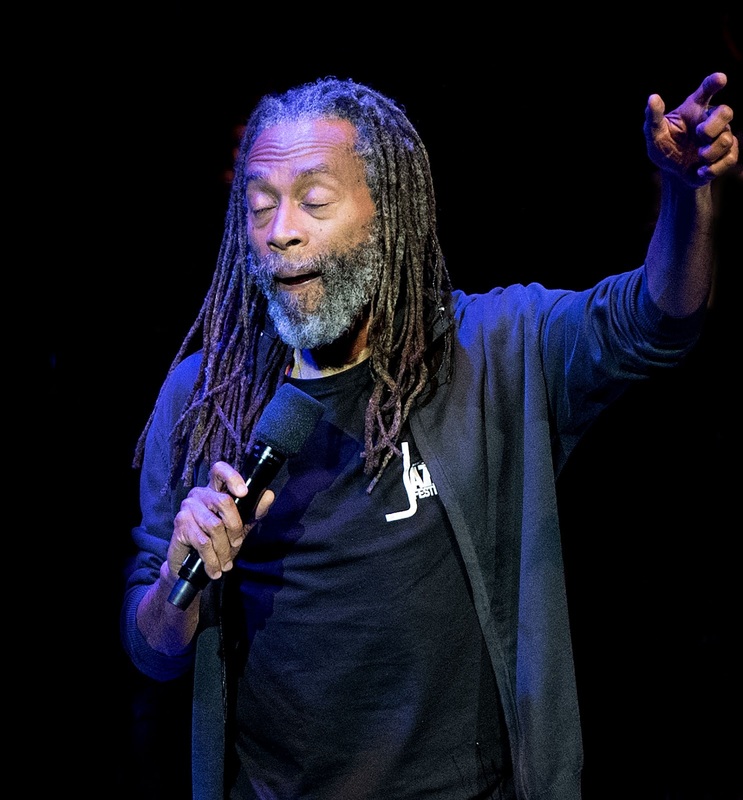 Though McFerrin sometimes performs what he calls ‘paper music’, which has been composed and written down at some point, the CircleSongs he makes with different versions of his Voicestra are improvised, crafted from small motifs that he sings and then passes on to other singers in the ensemble, conducting and orchestrating with gestures and by example. Built up over time, these themes and variations take on their own momentum and texture, and the songs can go in very different directions, like moiré or marbling patterns generated by juxtapositions of pattern or colour. It can be mesmerising, and it obliges the audience to listen ‘in the moment’. The evening’s first number evolved over an ambling bass (Blake) and jazzy ‘drums’ sung – and mimed – by Worm. The song next built gloriously over a lilting riff while the third song was more modal and contrapuntal with an even, almost ‘classical’ pulse. With a few gestures McFerrin invited the audience to join in with a simple, three-note phrase on two adjacent tones and we all became one big Voicestra. There are intimate moments: a duet for Rhiannon and Vinar, or a power trio with Blake’s bass, what sounds a bit like a feedback guitar solo by McFerrin and Worm’s remarkably convincing vocal ‘drums’. Rhiannon improvises a ‘stream-of-conciousness’ lyric that ends dreamily with a reference to Joni Mitchell’s Woodstock. McFerrin coaxes the audience to sing increasingly complex lines and we sometimes succeed, grinning like Cheshire cats as we fade in and out of the soundscape. It’s joyous fun, and it helps us recognise the high degree of artistry displayed by both the seasoned Voicestra and the specially recruited a cappella choir. Joey Blake takes the lead for one SongCircle, which allows McFerrin to take a breather. Blake’s approach is similar to McFerrin’s, yet the timbre of the former’s ‘head’ voice – high and clear, a little like Richard Bona’s – takes the sound in a gorgeous new direction. Dave Worm introduces a different mood for his ambitious SongCircle, in which he gets the audience to sing several distinct motifs. The result is a kind of world music ‘stadium anthem’ that is uplifting and beautiful, if some distance from jazz. McFerrin, however, lives and breathes vocal jazz, however wild and circuitous the vocal excursions (someone even throws in John Barry’s Goldfinger). A falsetto, Bach-like exercise mutates into hints of Don’t Worry, Be Happy, his 1980s hit, which he then sings over Worm’s fast beatboxing bebop – just for a minute – before shutting it all down with a wry smile. He thanks Voicestra and asks the choir to introduce themselves before they all walk briskly off stage, leaving 17 empty chairs. McFerrin returns for a completely solo encore. His version of Autumn Leaves may seem effortless, but it is also emotional and affecting, light yet deeply felt. You can hear the history of jazz in every note he sings, and in the spaces in between.